L 14 1/2″(37 cm) W 35″(89 cm). Description: Sexes similar. Dark gray above, paler gray below. Pale gray head. 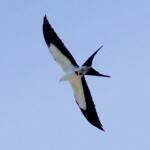 Black tail distinguishes this bird from similar White-tailed Kite. 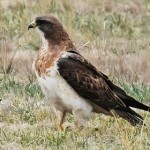 Juvenile is brown with heavy streaks and spots. Juvenile also has pale bands on underside of tail. 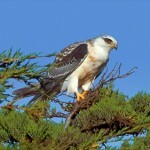 Food: Mississippi Kites catch insects on the wing, and will also take ground prey such as frogs and mice. Habitat: Scrub and open woodland habitat near water. Rare. Seen across the state. Where in Nebraska: Rare. Seen across the state. Breeding has occurred with a single pair since 1991 in Ogallala, Nebraska. 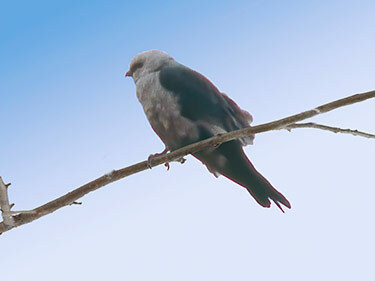 Fun Facts: The Mississippi Kite often attacks people who venture too close to its nest, especially in urban areas.